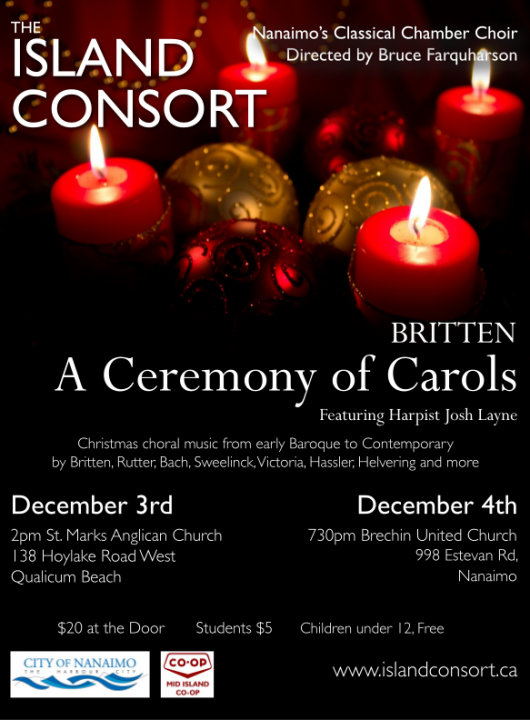 In a rare program for Christmas, the Island Consort Chamber Choir, directed by Bruce Farquharson, presents “A Ceremony of Carols”; a glorious melange of Christmas choral music from Baroque to Contemporary, which includes – as a featured work – Benjamin Britten’s “A Ceremony of Carols”. The program begins with the call to celebrate; Sweelinck’s joyful “Hodie, Christus Natus Est” followed by Hassler’s serene “Dixit Maria”. This leads to John Rutter’s arrangement of the very old Irish “Wexford Carol”, that dates back to the 12th century, and then “All My Heart Again Rejoices”, a lush 2012 composition in 8 parts by American composer, Douglas Helvering. Next, is “Jauchzet Frohlocket” from J.S. Bach’s Christmas Oratorio followed by Tomas Luis Victoria’s venerable “O Magnum Mysterium”. The 1st half ends with three familiar pieces: “The First Noel”; “Lo, How a Rose E’er Blooming”; and “Candlelight Carol”. Organ and piano accompanists are John and Margaret Nelson. Britten’s “A Ceremony of Carols” is a work in 11 movements based on early music (plainchant) and set to a collection of poems in Middle English. Written in 1942, the work is accompanied by a single harp – to be played by virtuosic Victoria harpist, Josh Layne. The concert ends with a traditional English carol, “Past 3 A Clock” and two popular Christmas songs; “Let it Snow” and “Have Yourself A Merry Little Christmas”.